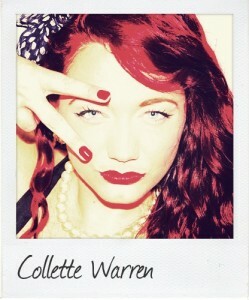 Collette Warren is a singer/songwriter born and raised in Birmingham, with influences from Motown, jazz, reggae and soul, funk, 90’s R&B and disco. She has been singing since a really young age, thanks to growing up in a very musical family. In 2007 she moved to London to follow her long-held dream of becoming an artist, and was quickly noticed by MC Tali, who asked her to join her live jazz band as a backing singer. This was an amazing experience, giving her the confidence she needed and allowing her the opportunity to play such legendary venues as Ronnie Scott’s and the Jazz Café. She continued working closely with Tali until 2012, performing at Sun & Bass and a major festival in New Zealand. Since then, she has begun to make a name for herself as a solo artist, performing solo at Sun & Bass in 2012, and then Renegade Hardware, D&BTV, Intrigue, Signal FM (Slovakia), Fizzy Friday and Superfine. In recent times Collette has been focusing on writing and recording new vocal material for many of the drum & bass scene’s leading producers. Artists she has worked with so far include Skeptical, FD, Stanza, Kasra & Enei, The Insiders, Ben Soundscape, Utah Jazz and Superior Selectionz. One of her most recognisable tracks of late is the massive ‘Always Been Mine’, due for release on Soul:R later this year. She has also featured on several deep house tracks with Jayce. After being a raver and dedicated d&b fan for over 13 years, Collette is now firmly establishing herself as a talented artist, and realising her dream. Look out for big releases this year on Intrigue Music, Soul:R, Exit and more.